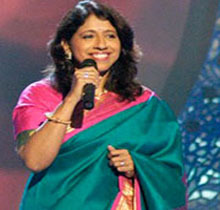 One of the most versatile veteran singers in the country, Kavita Krishnamurthy has been away from the music scene in the country for a long time, but has made her mark by performing at fusion concerts abroad. Radioandmusic.com's Anita Iyer chats with the 'Hawa Hawaai' singer of the '80s for her take on the current music scenario, reality shows and some of the highlights of her 25 years in the music industry. What are your current projects? Why don't we see much of you in Bollywood today? Why don't we see you judging any reality show on television? Although I have made guest appearances on some reality talent hunts, I have never taken up a full time jury job. Being on the jury demands dates for at least two to three months at a stretch, which I could not manage. That's why I had to turn down some offers. I am open to taking up an offer if it is an interesting show with like minded people around. Do you think reality shows are a good platform for upcoming talent? These reality shows are undoubtedly a good platform for young kids and I am certainly taken aback by some of the wonderful young voices on television. But what is sad is the emotions portrayed on screen, all these are appreciated because they guarantee more TRPs for the channel. Also, the SMS system of voting is inappropriate as regional votes help a participant and in the process, genuine talent is lost. There are cases when the participants are voted on the basis of the way they look and their makeovers, rather than their voices. I believe in the thought that 'It's more important that you sing like a queen and look like a donkey rather than the other way round'. You started your career with Doordarshan. I would say those were the golden days of television when there used to be only Doordarshan and no cable networks. I remember musical programmes like Shame Ghazal, Chitrahaar, Show Theme and may others and it was a great platform for aspiring singers. Today, everything is related to the TRP with oodles of emotional drama and nothing is pure. Everyone is pumping in emotional drama to increase the TRPs. You entered the field when it was dominated by senior artistes. What do you think is the scenario today? The time I entered the music industry it was primarily dominated by two music maestros - Lataji and Ashaji and I was fortunate to be a part of the same era. I believe that these two singers are a legend in the music industry and I got to learn a lot from them. Initially, I started off as a dubbing artiste, dubbing three to four songs a week. These songs would be later recorded in their voices. Songs like Tumse Milkar and Hawa Hawaai were some of the songs which were dubbed by me earlier but not sung by them later, so I got a break in the industry. 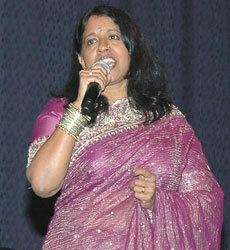 Later in the 1980s, Alka Yagnik, me and Anuradha Paudwal got the opportunity to sing many songs. Now, the concept of dominance seems to have been lost as there are many young singers, who are getting opportunities to work with big names in the industry. Each of them has their own unique style and the field has opened up with many opportunities. What is your take on the remixes that abound now? I am not a remix person at all and I do not understand them! However, remixes did open up loads of opportunities for many who made their careers through them. But I am against the explicit videos that come along with the remixes. I believe pure music need not resort to such cheap videos and it is not a part of our Indian culture. Videos do not have a good impact on young minds and commercialisation is bearable only till a certain point. What is your take on the item songs and the changing lyrics in Bollywood? Item songs existed even in our times, like I sang "Tu cheez badi hai mast mast" but they were done in a pleasant manner. Much of the video part even depends on the director and the way the song is shot. Item songs were essentially a part of Bollywood even three decades ago, but the way it is treated today has changed. The lyrics of today are not the way they used to be in the near past. Earlier, the songs had beautiful lyrics imbibed with great meaning. There was continuity between the antara and the mukhda but today there is no flow between them in the song. I don't understand the lyrics today and it is also difficult to remember them! Where is the classical genre heading to in the Bollywood music industry? Pure classical music no longer exists as there are not many takers for it. Today, what is available is fusion of classical with different genres, like we have a bit of western, pop with classical. Such fusions do not hold any emotions and the song seems cluttered as there are too many things infused in the classical one. Do you think you got enough opportunities to experiment with your voice in different genres? The most difficult part is judging oneself but I do think I had opportunities to experiment with my voice. I always used to crave to sing romantic melodious songs in the movies but they rarely came my way. In any movie, all the difficult and challenging songs came to me, which if I look back today, feel was good for my career as it gave me ample opportunities. You have worked with music composers of different times. How has been the experience? I feel blessed to have performed with a wide range of music directors like Laxmikant- Pyarelal, R D Burman, Khayyam, Naushadji, Usha Khanna, Bappi Lahiri, Manna De, Mahendra Kapoor, Hemant Kumar and Rahman throughout my career. Working with these directors, I had a wonderful journey in the industry, singing songs of different genres. How has the position of women in the music industry evolved? I remember when I entered the field it was still not a viable option for many females as it involved meeting varied people from the industry. But slowly, the mindset of the people changed and we had many female singers in the music industry. Also, I believe that it is mainly the way you behave and look at the industry, since people react in the same manner. I have been lucky that I was able to work with dignity in the industry and people really treated me with respect. When I look back, the journey has been very fulfilling for me. How lucrative is it to perform abroad as against in India? Abroad, people appreciate Indian music a lot. With the keen interest of westerners in our music and improvisation of Indian taals and ragas, there is an amazing response to classical music today. Although it is not a new phenomenon, as even in concerts held about 20 years ago, the whole auditorium used to be filled with non-Indians. Foreign jazz musicians are inclined towards Indian classical music and want to learn our music. It is only now that Bollywood music is picking up pace abroad. How is it sharing a platform with your husband Dr L Subramanium? From the past few years, I have been collaborating with my husband and I have realised that his approach to music is very different from what I perceived it to be. Working with him, I appreciate his understanding of music and have realised that there are so many things I don't know about music! He has performed with many bands and musicians abroad and has worked on global fusions and performing with him gives me an insight into different genres across the globe. It gives me immense pleasure that being a film singer, I was able to break barriers and entered the fusion arena. Which is your personal favourite from all your compositions? I love the song Hawa Hawaai, then compositions from Khamoshi, 1942 Love story, Hum Dil de chuke sanam are some of my favourites. Amid the many record labels existing in the country, a new addition has recently happened in the form of 9122 Records founded by Sunil D’Sa. Amazon Prime India released the trailer of their first Prime Original music reality show The Remix. The show judged by Sunidhi Chauhan, Nucleya and Amit Trivedi would premier on Amazon Prime video on 9 March. The show has already set high expectations with the trailer. MUMBAI: Ever since the youth portal 101India came into sincere attention in the music community, the entity has explored its options of delivering consistent content without the much-needed financial backing from any sponsor or brand. We have heard of a Gully rapper, Bollywood, underground, hip-hop and even a desi rapper, but have you ever heard of a ‘wedding rapper’? Well, yes, there exists one in our very own country. In fact, his identity was born, much before Gully Boy and MC Sher hit the silverscreen. Famous as DJ Zenith globally, Harshit Agarwal is a known face in the electronic dance music circuit (EDM), both, in India and internationally. Having started his career in 2014, this talented DJ, from Jaipur, took the EDM music scene by storm within a short span of time. MUMBAI: “When you are in a room and have been given power to control every single person’s emotion in that room, that is surreal to me,” is what DJ Shiva Manvi, a Bangalore based DJ said while Radioandmusic interviewed him at Sunburn 2018. MUMBAI: American pop singer, Jeff Timmons, who recently performed live at Lord of the Drinks in Mumbai, had a gala time in India. Marking his maiden live performance, Timmons was spellbound by the crowd’s response, the musical diversity he found here and much more.